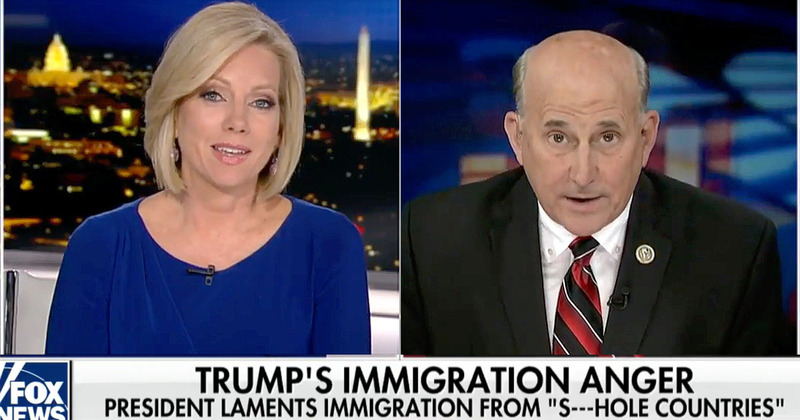 Rep Louie Gohmert (R-TX) doesn’t bother to defend President Trump’s choice of language to describe the “sh*thole countries” that receive what is an obvious racist preference for immigration as part of the browning of America initiated by the globalists Bush and Obama. He instead chooses to focus on the frustration that the President, Congress and patriotic Americans who voted for him feel with the process. Gohmert notes, “The only people they want to talk about being dreamers are people who came into the country illegally.” Gohmert notes that they’re not kids any longer and many of them don’t even speak English, despite their free educations and support. He also reminds the audience how every instance of amnesty talk results in a surge at the border and how anyone given any type of legal status will eventually be made a citizen, citing the 3/5 of a person from the days of American slavery as a situation that will not be repeated for long. Gohmert points out the obvious that nobody wants to talk about, the fact that those who are demanding the immediate legalization of these non-citizens are the same ones to obstruct any effort at border security. Their goals are not to secure the nation but to maintain the flow of illegals until we are sufficiently overwhelmed and our nation is stolen away from us. He says that a wall is not necessary for the entire length of the border but that there are hundreds of miles where it is. He also draws lessons from the 1986 amnesty in which border security and amnesty were combined into one bill. The amnesty was implemented immediately and the security never happened. He says, “We have got to not put the cart before the horse or we’re going to run this cart and horse right off the cliff.” Shannon Bream states that there are people unhappy on both the right and the left with what they are hearing proposed so far. Gohmert injects, “Like the people who voted for Donald Trump.” Bream agrees, “Yeah, a lot of those folks, you’re absolutely right.” Hopefully President Trump was watching. I listen to all the “conservatives” saying we cannot allow what has been going on and America and Americans are being devastated by illegals, state how the economy is suffering. Then at the end they all say but we may have to do a deal to get the wall. I feel like throwing a brick through the TV. When Trump was campaigning, I watched a live interview he did with a large group of Haitians, wherein he promised to look into the huge sums of money donated for Haiti to the Clinton Global Initiative. Apparently, they received next to nothing. I also wondered how much of the millions collected by CGI and GWB on an earlier campaign went to the Indonesian tsunami victims. If little to none, why not? The libs want the Haitian people to think Trump hates them. Not true! I wonder if the President knows he will loose all of his “deplorables” if he lets the DACA people stay. People don’t know what these people are taking from American citizens, our jobs, Welfare, educations, food stamps and Medicaid to name a few. 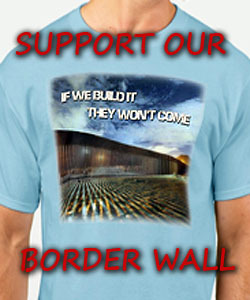 We could build 10 walls with the money that is spent on all of the illegals and refugees in our country. They all need to be deported and give America back to it’s citizens. Well then, President Trump had better not give us DACA amnesty, and he has to know that if he does he will lose a lot of support, not to mention the states which will go blue because of their voting power. Taxpayers have been bled dry supporting illegals in this country, time to send them all back. i HOPE TRUMP was watching? because if he CAVES to these DISGUSTING COMMUNIST DEMORATS HE CAN FORGET 2020.